Yes, the rumor is true! Troubletown teams with Passionfish! P’fishers! We’ve hit the jackpot! No, we still exist on fumes and chef Andrew’s good looks (see above). But, we’re super happy and honored that our good friend Lloyd Dangle of Troubletown is joining us at the Hotel Del Coronado in June! We’ve been anglin’ to wrangle the Dangle for a long, long time. Yes, if Andrew’s likeness looks familiar, it’s because Lloyd is the wiz behind the iconic Airborne packaging. But wait, there’s so much more! Cruise through Lloyd’s portfolio today! See you ‘toonies in Coronado Island, June 6, 2010. Be there or be square. P’fishers who don’t live in New York and therefore missed this weekend’s cooking demo by our very own Director of Culinary Education Gerard Viverito, please check this link for a cooking demo of seared halibut and beet salad and its accompanying fin-tastic recipe. P’fishers, meet the little boy behind Passionfish. I first “met” Remi at a Berkeley, Calif, art gallery which featured a couple of super-rare images by the famed Edouard Boubat, the French “poet with a camera” who lived from 1923-1999. Do check his range of work. Beautiful, touching, compelling work from photojournalism to fine art. First, though, let me tell you the trip I took to get Remi onboard! Remi, to me, represented (~still represents) the purpose of our effort. I knew that we would be creating children’s education about the ocean and its inhabitants. I knew that the future of our planet depends on the kids out there, and that whatever we adults are doing to our planet will be left with our children. Remi represents this– the beautiful image by his grandfather in this quiet moment reflects the hope and connection to our sea, and to nature in general. I had to first seek out the rights to use Remi’s image and that was not easy! This was around 10+ years ago — and while we had the Internet and search engines, they weren’t exactly populated. Eventually, after using an actual TELEPHONE (the kind with the cord attached! ), I found and talked with the gallery in New York City featuring Mr. Boubat’s work. They, in turn, led me to France to Mr. Bernard Boubat, Edouard’s son and Remi’s father. 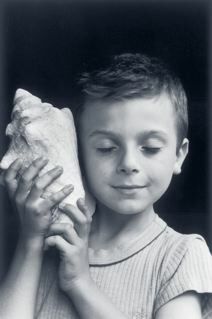 Bernard Boubat is, in his own right, a brilliant photographer! And he manages the estate of his father Edouard. Then, I had a friend who is French translate a letter I had written asking for permission for Remi to represent Passionfish. I found out that the use of Remi’s photo is very, very rare. Amazingly, Mr. Bernard Boubat granted us the rare use of the beautiful image since we represent a worthy, purely educational cause that they care about. I sent Remi a Passionfish baseball hat and want to see him model with it on our page! …it really is never ending. There are a zillion reasons all of this still occurs such as “corruption,” “greed,” “inequity,” “lack of enforcement,” so on. And, sadly, as much as we surely want to, we can’t solve all of that with our little group. Wildlife ~or biodiversity as it’s called~ is disappearing on our planet. Whether terrestrial (land) animals or marine (ocean) animals, we humans have pretty much had our way with them and the place we ALL call “home.” Problem is, the animals can’t speak up for themselves to claim their turf. It’s now 2010. We’ve known about the loss of wildlife on our planet for a long, long time. Growing up, I watched “Mutual of Omaha’s Animal Kingdom.” I thought the world looked like that “out there.” I thought there were still a whole lot of awesome creatures out in the world in their natural habitats. Tragically, that’s not the case much anymore. The remaining endangered and threatened creatures are being protected as much as possible by devoted individuals and groups and governments given limited funds. So many groups are trying to save the remaining animals in the wild and to educate the public about their value. Please support them. Our group is one of them. Our nonprofit Passionfish is completely funded by individual donors and our team; it’s an all-volunteer operation. We have become pretty skilled at asking for “freebies” and maintaining our own paying gigs to make it so the nonprofit sustains itself. For example, co-founder Andrew Spurgin runs Waters Fine Catering in San Diego. Carl Rebstock is a US Army Colonel and manages emergency medical response across a 20-state region. 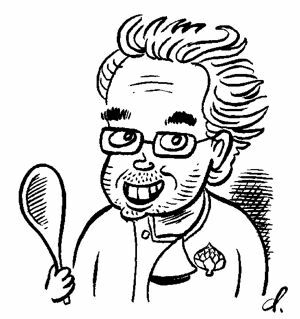 Gerard Viverito is an executive chef and educator at the Culinary Institute of America in New York. And, among my communications work, I created a children’s apparel company, Fashionfish, to generate revenue for ocean education. We simply enlist other passionate “Passionfish’ers” in our network to help us execute our programs…for free. We all do it, our extended network across this country, because we care about the future. Meanwhile, we are living in a crazy time when people are addicted to — and even losing their jobs from — Facebook’s “Farmville” with its simplistic cartoony characters populating a farm that they “care for” with their mouse-click husbandry skills. Or where real-live humans somehow marry “avatars.” What?! And when people are suffering from “Avatar Blues,” which is a new syndrome, apparently, where after seeing the movie “Avatar,” people are so distraught that the real-world isn’t the bright utopia like the fictional world called Pandora that they become depressed and suicidal. Really? I don’t want to live in that bogus fantasy world. Make it work, I say, like fashionisto Tim Gunn. Make it work. Let’s get back to reality. Remi — a REAL kid in a REAL place — represents hope for the future. Hope for the future is a fine art in itself! Anytime I get “down” about the state of our planet, our resources, our dwindling nature, and the ugly politics of it all, I look at Remi and know I’m spending my time and money doing the right thing…I’m putting my time and money on hope. Join us during World Ocean Week. We’ll be hosting a discussion aimed at solving the crisis in our ocean on Sunday, June 6, 2010, at the Hotel Del Coronado in San Diego. I will post details here on the blog as time goes on. Thank you very much, Mr. Remi Boubat, Mr. Bernard Boubat, and the many other troopers in our Passionfish network.